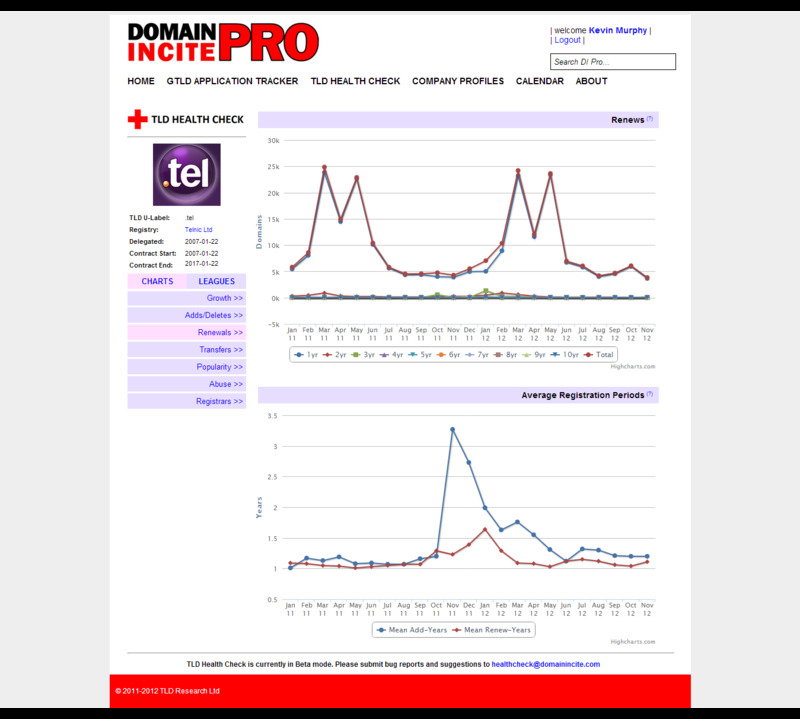 DI today introduces TLD Health Check, an industry-first business intelligence service that enables users to quickly and easily monitor the performance of top-level domains. TLD Health Check is software as a service. It allows anyone to not only track the growth of gTLDs new and old, but also to compare TLD popularity and abuse levels across the industry. Monitor the growth of gTLD registries. gTLD growth (or shrinkage) can be tracked against multiple criteria including domains under management, newly added domains, renewals and deleted domains. Based on official registry reports, the service also dynamically calculates metrics such as average registration periods, enabling users to gauge registrant confidence in each gTLD’s relevance and longevity. Rank TLDs by popularity. TLDs can have lots of domains, but which TLDs are being visited most often by regular internet users? TLD Health Check aggregates TLD data from Alexa’s list of the top one million most-popular domain names, to figure out which TLDs web surfers actually use on a daily basis. Compare abusive activity across 300+ TLDs. TLD Health Check calculates TLD abuse data from several major third-party malware and phishing domain lists, letting you instantly compare abuse levels between every live TLD. 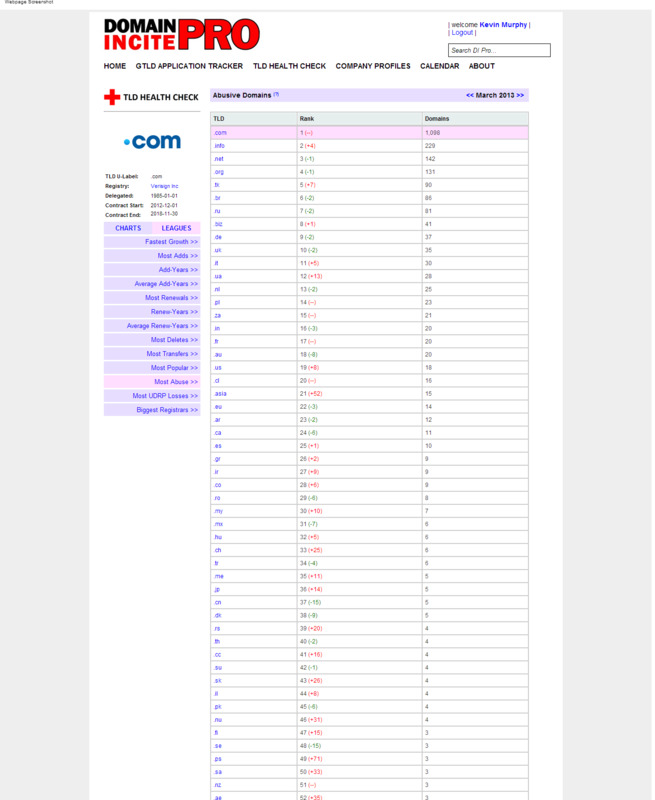 Track cybersquatting levels by TLD. Drawing on a database of over 75,000 UDRP decisions, TLD Health Check lets you compare TLDs to see where the major cybersquatting enforcement is happening. DI PRO’s intelligent algorithms allow you to see only successful UDRP cases. Measure registrar market share. Different registrars excel at selling different TLDs. 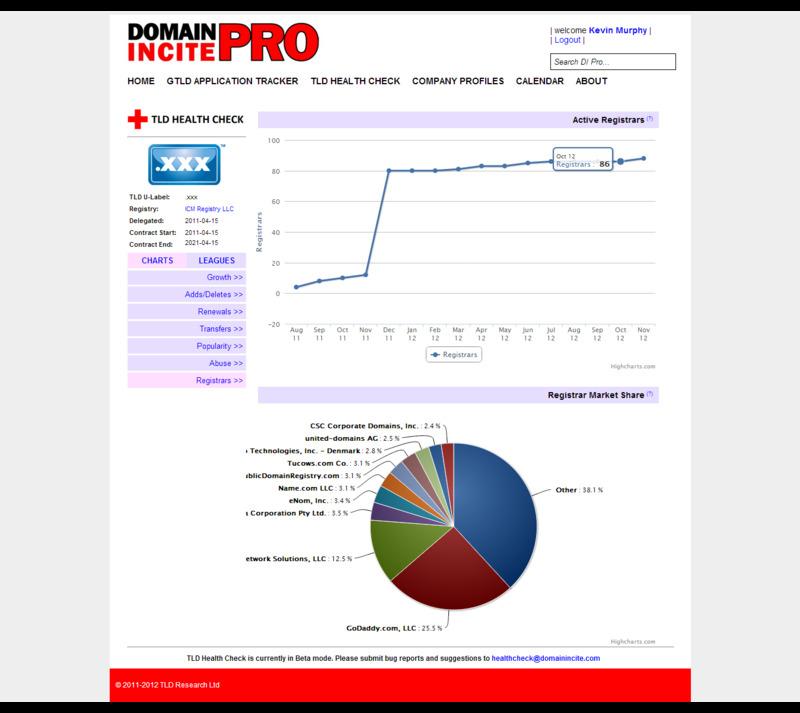 TLD Health Check measures registrar growth and ranks companies by their market share in each TLD. (Coming Soon) Monitor secondary market activity. Leveraging a database of tens of thousands of reported domain name sales, you can see where the secondary market action is. The services is built on top of a massive database, over two years in the making, comprising hundreds of thousands of records dating back to 1999. Our data sets are updated hourly, daily, weekly and monthly. TLD Health Check is currently in open subscriber beta, and we have an aggressive program of weekly feature upgrades and additions planned for the next few months. The service can be accessed now by DI PRO subscribers, for no additional charge. If you’re not already a PRO subscriber, please visit our subscriptions page to sign up for instant access. To coincide with the launch of TLD Health Check, and in response to many reader requests, today we’re also announcing a new monthly subscription option for DI PRO. Not only that, but any new subscriptions processed before March 15 will receive a perpetual $10-per-month discount if the subscriber uses the discount code NYC when subscribing. This week, the operator of the forthcoming Trademark Clearinghouse — which will underpin Sunrise periods in new gTLDs as well as the new Trademark Claims service — released its price list. Two payment mechanisms are expected to be available: Basic, for trademark owners with 10 or fewer trademarks, and Advanced, for large trademark portfolio owners and companies that wish to act as submission agents (such as digital brand management companies). As the prepaid Advanced system is somewhat complex, with five tiers of discount and an accumulating points-based mechanism for determining eligibility, we’ve designed a simple, easy-to-use tool for helping companies calculate their likely fees. Check out the Trademark Clearinghouse Cost Calculator here. Simply enter how many one-year, three-year and five-year registrations you expect to make, and the tool will present three pricing scenarios, designed to show what possible savings could be made by submitting longer-term registrations before others. The tool also supports the Early Bird bonuses that the Clearinghouse intends to offer. These bonuses make it easier to achieve discounts more quickly, but only for registrations are submitted before the first new gTLD’s Sunrise period goes live. The under-the-hood calculations are based on the official pricing scheme published yesterday by the Clearinghouse here (in PDF format). Karim Jiwani worked at Afilias from 2002 as managing director, EMEA, until May 2011, when he was hired as CEO of .pro registry manager RegistryPro. In early 2012, after RegistryPro owner Hostway Corp identified the registry as non-core to its business, Jiwani negotiated the sale of the unit to Afilias. He continues to work as president of the RegistryPro business as part of the Afilias stable. He spoke to DI PRO in early January 2013, the one-year anniversary of the acquisition, to frankly discuss the challenges of running a restricted gTLD registry, dealing with abuse, preparing for new gTLD competitors, and, in light of a 100% increase in .pro domains under management in just 12 months, how restrictions do not have to hinder growth. We’ve made a number of updates and enhancements to the New gTLD Application Tracker database and search engine in December, designed to make it easier for applicants and other interested parties to predict the potential competitive environment as applications head into the home stretch of final approval and ultimate delegation. Priority Numbering. Each application is now trackable by its Prioritization Draw number, and the search index is sorted by priority by default. GAC Early Warnings. Each of the 241 Early Warnings submitted by the Governmental Advisory Committee has been linked to the relevant application. Warnings are downloadable in PDF format from the application view page, if applicable. Search queries can also be configured with a click to exclude all applications that received warnings. Note that the database does not currently include warnings that were filed late by the European Commission and Iran as it is not yet clear whether these are “official” Early Warnings.The database will be updated when their status is clarified. Advanced Search. Nine new options are available in the search engine, designed to make it easier to see the data you want to see by excluding certain types of applications — such as those with Early Warnings — from your queries. IDNs. You can now choose to exclude IDN applications or non-IDN applications if you’re only interested in one or the other. Geographic and Community applications — which may trigger certain special evaluation criteria with associated timing implications during the ICANN process — can also be removed from results as desired. Registration Policies. If you’re interested only in applications for “Open” gTLDs — those without any planned registration restrictions — you can choose to ignore Single-Registrant (including dot-brand) and “Restricted” applications in your results. Contention. If you’re attempting to predict a possible delegation queue, you can exclude all contested applications — which may, failing early resolution, be delayed by auctions or other settlement processes — from your results. On the assumption that two-way contention sets are more likely to be quickly resolved than larger ones, you can also choose to exclude only contention sets with more than two applicants from your results. To see an example of the kinds of results pages than can be built, clicking the search button below will generate a prioritized list of Open, non-IDN applications that are have two or fewer applicants and no GAC Early Warnings. As before, the database is in most cases aware of applicants’ corporate parents. A query for “donuts” in the applicant field will generate results associated with Donuts Inc, for example, regardless of the legal name of the applicant. The Application Tracker will continue to be enhanced as the new gTLD evaluation process continues. When Objections and GAC Advice begins to be published in March and April, for example, the Tracker will be updated to enable filtering based on those criteria. Starting at approximately 2130 UTC today, DI PRO will be providing live results from the ICANN new gTLD Prioritization Draw. The results of the Draw will be posted to a table on this page as soon as they start coming in. The table — which automatically lists the applicant name and applied-for gTLD — is sortable, applications are linked, and the table can be filtered by gTLD in the case of contested strings. Due to the rapid influx of data expected during the live event, and the potential for an unreliable remote participation connection, data presented here should be considered preliminary in nature and may be subject to temporary errors. After all results are in, the data will be added to the DI PRO New gTLD Application Tracker. ICANN’s webcast of the event will be linked to from this official page when it begins.